Player shot maps are updated. Craig Anderson's already faced 40 xG. Oh great, Gauthier's making me agree with Jeff O'Neill. Where were these charts when I was passionately defending Philippe Dupuis' play in 2011? Jeff O'Neill makes me laugh. Love his non sugar coated comments. What I’ve really come to understand from doing this project is that we can’t live by what’s counted for as shots on goal in an official capacity. The only way you can be 100 percent accurate is if you have two sets of eyes on every game — live on the game and then another person on the computer reconciling what’s coming in. We have first, second and third looks at every chance. Our numbers will never be the same as the NHL’s. And we’re OK with that because we’re doing the due diligence that needs to be done. This affects shooting percentages, save percentages, things that are coming into play when contracts are being discussed. Distance from the net, plus deflections on the ice don’t go in as frequently as ones off the ice. It wasn’t really that hard of a save. When you look at our designations, your goalie can never let a red one in. You need saves on the yellow ones and you can live with goals on the green ones because you’re only supposed to give up maybe six a night. And one of every three of the high-percentage shots goes in every night. One of three, one of three — breakaways, odd-man rushes, broken plays, it always comes back to that range. 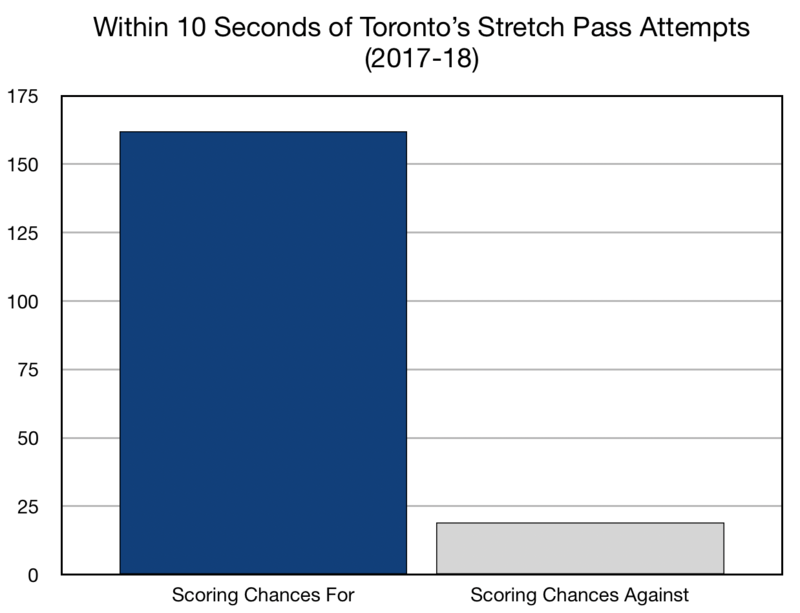 That last part might give an indication as to why the Leafs have overused the stretch pass play. When it works, it's a 27-30% chance at a goal. When it doesn't, it's the puck in a reset position. What they need to do more is use a larger variety of plays to take advantage of a defense that is defending the stretch pass (a la football runs vs throws). Good thing I didn't bother looking up more numbers about this. If that's the gamble (and note that a scoring chance off a successful stretch pass is a partial/full breakaway, which has a 27-30% chance of resulting in a goal), then yeah, of course they're going to fire away (oh man, wait 'til you see Liljegren on the Leafs). If a stretch pass completes, it's either a rush chance, or an opportunity to set up on a panicking defense. If it misses, it's either an icing, or a turnover in the other zone with all players on top of the puck. What we've seen lately is better forward support recognizing when the stretch play is not the right option and swinging lower (F3 below the blue), and generally more skill with the puck up and down the lineup to facilitate holding and waiting a little bit longer. The guys they're firing up the ice are the diggers who aren't really handlers (Hyman, Brown) or speedsters (Kapanen, Ennis). If you can spring Kapanen for 3 breakaways a game, he's going to average out just a hair under a goal per game if he only had average skill (he has more than that). 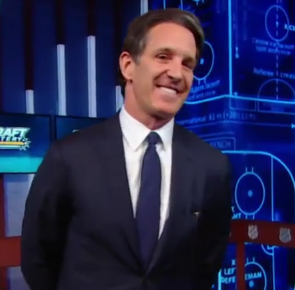 Babcock on flip passes: "The league is up so tight on you now. Everyone talks about entries and stuff like that. Three-quarters of the time there's no entry because people are on top of you so hard, the space is behind people." So anybody picturing TML (Timothy Mattias Liljegren) getting called up to TML this season? Anything's possible but I wouldn't count on it. Still seeing comments that his defensive game needs work. A full season getting top pairing minutes on the Marlies is probably the best plan. I think the Leafs might actually be good? They’ve been really solid starting from that Dallas PDO loss at the beginning of the month, maybe even the Winnipeg set barring those blips to Pittsburgh and Calgary. The big difference has been the team effort in puck pursuit and sort outs on retrieval. It's even more impressive when you consider they've done it all without Nylander, and a good chunk without Matthews. I still have concerns that certain teams such as Boston will be able to completely shut the Leafs offense down. Also big physical teams like Washington give me pause. Isn't that when Auston Matthews got hurt? Page created in 1.198 seconds with 27 queries.